By 2021, cybercrime is likely to cost the world $6 trillion annually – more than the combined GDP of the UK and France, but as companies embrace new technologies, so do hackers, and the reluctance of organizations to share cybersecurity information makes benchmarking and planning more challenging – Until now. 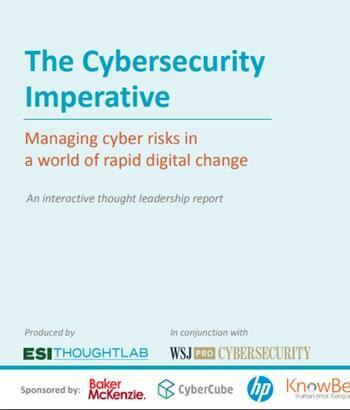 Protiviti joined ESI ThoughtLab, WSJ Pro Cybersecurity and a group of prominent organizations to launch The Cybersecurity Imperative: Managing Cyber Risks in a World of Rapid Digital Change, a thought-leadership program drawing on global research, CISO expert interviews, and Insights from an advisory board of executives. To complete this study, 1,300 global executives were surveyed, advisory meetings and interviews were conducted, and analytical tools were developed to benchmark approaches and assess performance impacts. This research covers key industries in the eye of the digital storm: financial services, healthcare and life sciences, consumer goods and retail, and manufacturing.